A veritable goldmine of quotes, and surely the best hope for the progress of science this side of Murray Gell-Mann. Let’s celebrate this essay by Georgia Tech’s Judith Curry: “On the Credibility of Climate Research, Part II: Towards Rebuilding Trust“. 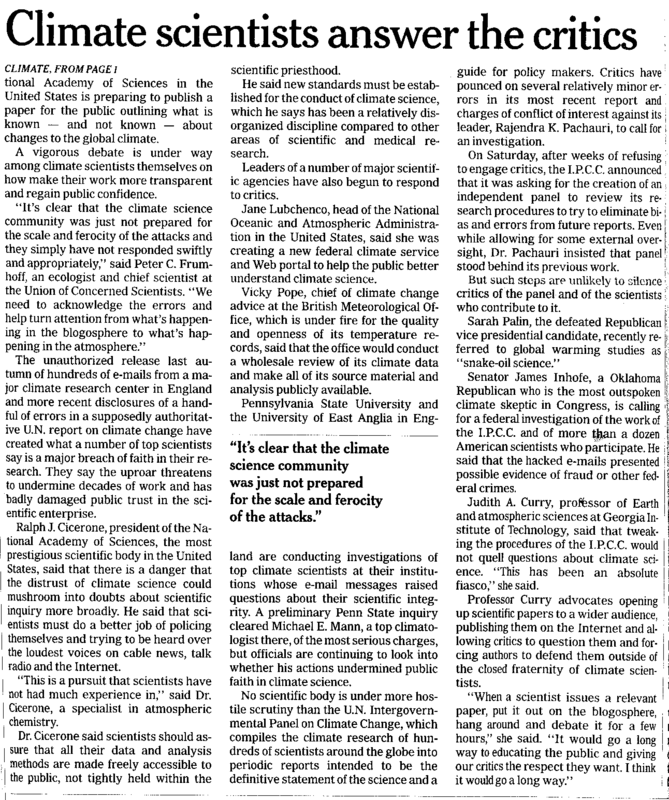 I have a strong feeling that anybody else selected to carry forward the (reformed) IPCC will look far lesser capable than Prof Curry. In responding to climategate, the climate research establishment has appealed to its own authority and failed to understand that climategate is primarily a crisis of trust. expertise itself is not a sufficient basis for public trust. host of concerns about the IPCC […]: involvement of IPCC scientists in explicit climate policy advocacy; tribalism that excluded skeptics; hubris of scientists with regards to a noble (Nobel) cause; alarmism; and inadequate attention to the statistics of uncertainty and the complexity of alternative interpretations. The jury is still out on the specific fallout from climategate in terms of the historical and paleo temperature records. concerns […] with Working Group II: has a combination of groupthink, political advocacy and a noble cause syndrome stifled scientific debate, slowed down scientific progress and corrupted the assessment process? when your science receives this kind of attention, it means that the science is really important to the public. Therefore scientists need to do everything possible to make sure that they effectively communicate uncertainty, risk, probability and complexity, and provide a context that includes alternative and competing scientific viewpoints. 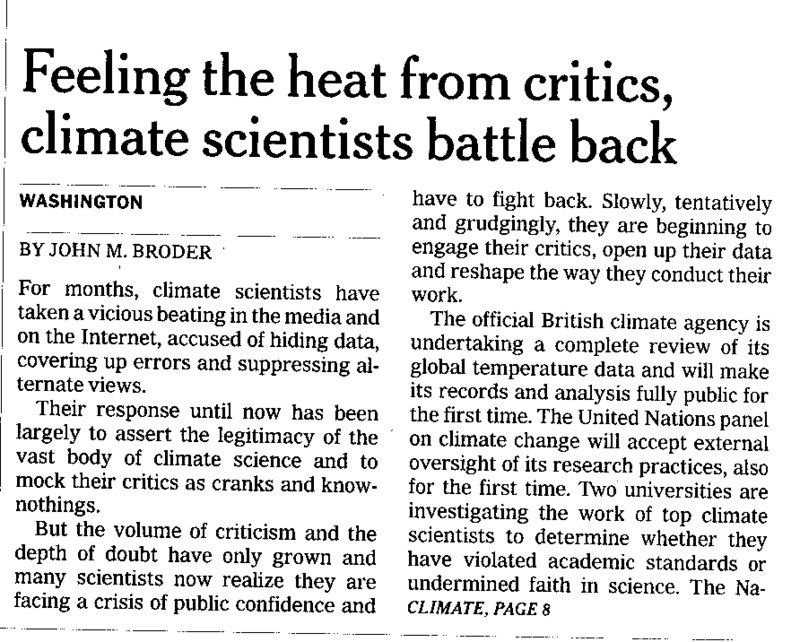 I have come to understand that global warming skepticism is very different now than it was five years ago. [After the IPCC 4th Assessment Report] big oil funding for contrary views mostly dried up and the mainstream media supported the IPCC consensus. But there was a new movement in the blogosphere, which I refer to as the “climate auditors”, started by Steve McIntyre. The climate change establishment failed to understand this changing dynamic, and continued to blame skepticism on the denial machine funded by big oil. So how did this group of bloggers succeed in bringing the climate establishment to its knees (whether or not the climate establishment realizes yet that this has happened)? Again, trust plays a big role […] the climate auditors have no apparent political agenda, are doing this work for free, and have been playing a watchdog role, which has engendered the trust of a large segment of the population. People have heard the alarm, but they remain unconvinced because of a perceived political agenda and lack of trust of the message and the messengers. At the same time, there is a large group of educated and evidence driven people (e.g. the libertarians, people that read the technical skeptic blogs, not to mention policy makers) who want to understand the risk and uncertainties associated with climate change, without being told what kinds of policies they should be supporting. building trust through public communication on this topic requires that uncertainty be acknowledged. Trust can also be rebuilt by discussing broad choices rather than focusing on specific policies. I have certainly learned a lot by participating in the blogospheric debate including how to sharpen my thinking and improve the rhetoric of my arguments. we need to acknowledge the emerging auditing and open source movements in the in the internet-enabled world, and put them to productive use. The openness and democratization of knowledge enabled by the internet can be a tremendous tool for building public understanding of climate science and also trust in climate research.